I am a little slow to jump on the overnight oats/overnight oatmeal wagon. I tried the store bought kind and thought they tasted awful and had a weird texture, so I left them alone for a long time. With school coming up, and one everything eater and one picky eater (he wants only oatmeal or cereal), I wanted to experiment with easy breakfast foods. We had already tried my no-bake peanut butter chocolate chip granola bars with success, but I was looking for a wider range of options. So back to overnight oats I went. However, this time I tried making my own, which worked so much better. 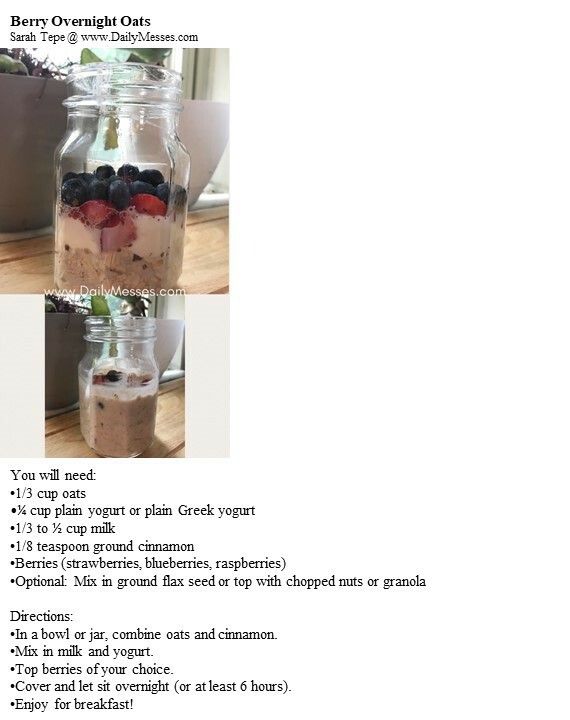 Now, I know all the images of overnight oats look amazing with their different layers in the jars, but I found that mixing the oats, milk, and yogurt together helps coat all the oats so they absorb the liquid better overnight. I mix it all together, then I add on the toppings. For all of the recipes, I used Old Fashioned Oats and Greek yogurt (plain or vanilla). I like the extra protein the Greek yogurt provides, although it does give a tangier taste to the oats. 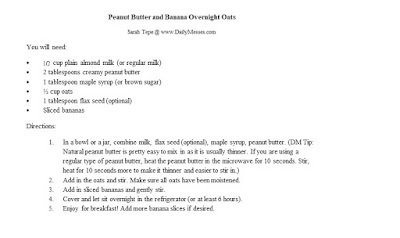 Most of the time, I found adding a 1/2 cup of milk worked the best, but I believe the type of oats and other fillers change the amount of milk needed. You can always stir in more milk in the morning if it is too thick. For my first recipe, I did Berry Overnight Oats, which was a big hit with Higgins. Bernardo still didn't like the texture. For my jar, I added chopped pecans to the top of the oats for a little crunch. 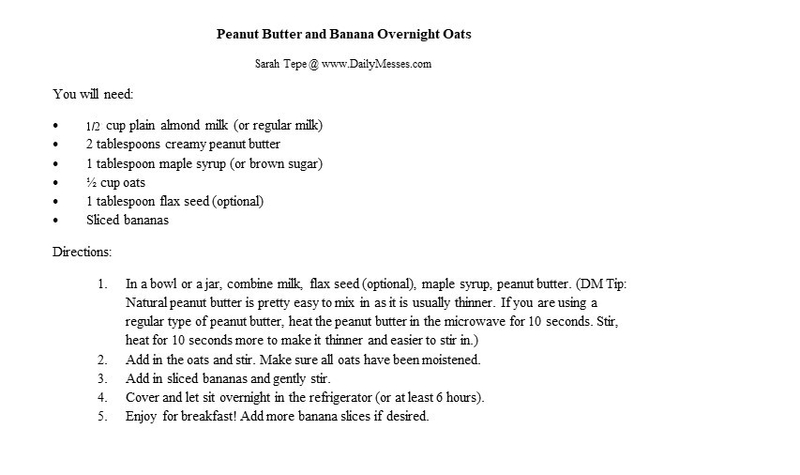 I wanted to have an option with more protein for the long school mornings, so I played with some peanut butter options. 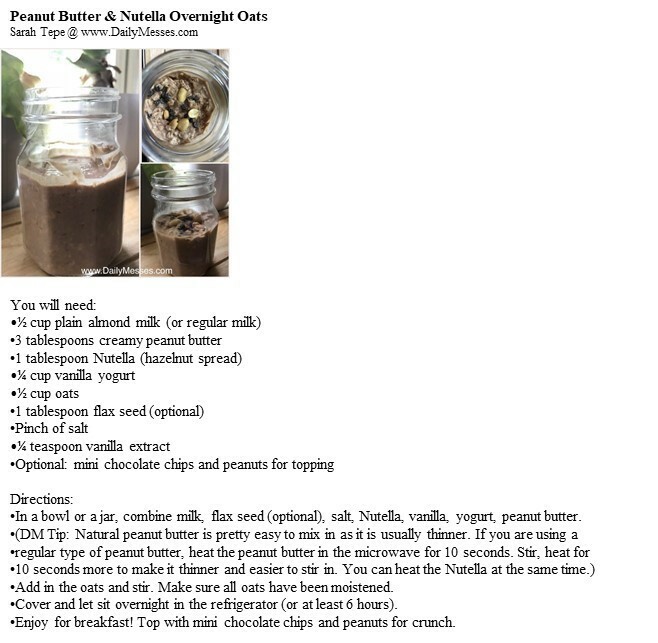 Our two favorites were Peanut Butter & Nutella Overnight Oats and Peanut Butter Banana Overnight Oats. I added in ground flax seed to these and they never knew the difference! For a little extra crunch, I added in mini chocolate chips and peanuts to the top. I like the taste, but the texture still bothers me a little unless there is a little crunch to it. Sorry for not having a picture of the peanut butter and banana! I forgot to take a picture of it before the kids ate it! We ate these cold, but you could heat them up. I would leave the berries and bananas off until after you heat the oatmeal. The above recipes are a jpeg/picture. To print, right click on the image, click Save As/Save to Computer, Print from your computer. However, to try to make printing easier, I have PDFs below that you can also save or print from!